Here is my problem. It said I qualified for a $7,593 subsidy. My current plan costs me $4,800 a year and fits within my HRA allotment with room to spare. Some pundits have argued that my plan is substandard. So I ran my grandfathered AARP-Aetna plan($3000/$5000/80%) through the CCIIO actuarial value calculator and it came up 64.1%. My plan does not cover maternity, office visits, and probably does not cover mental health problems. The only way I can imagine using the mental health feature is if my 59 year old wife gets pregnant. Except for the lack of maternity coverage it reminds me of my health insurance in the 1980’s. So I have a plan that is slightly better than a bronze plan that fits within my HRA allotment without a subsidy. The new features in the Affordable Care Act plans might be better for someone but I have zero value for them. 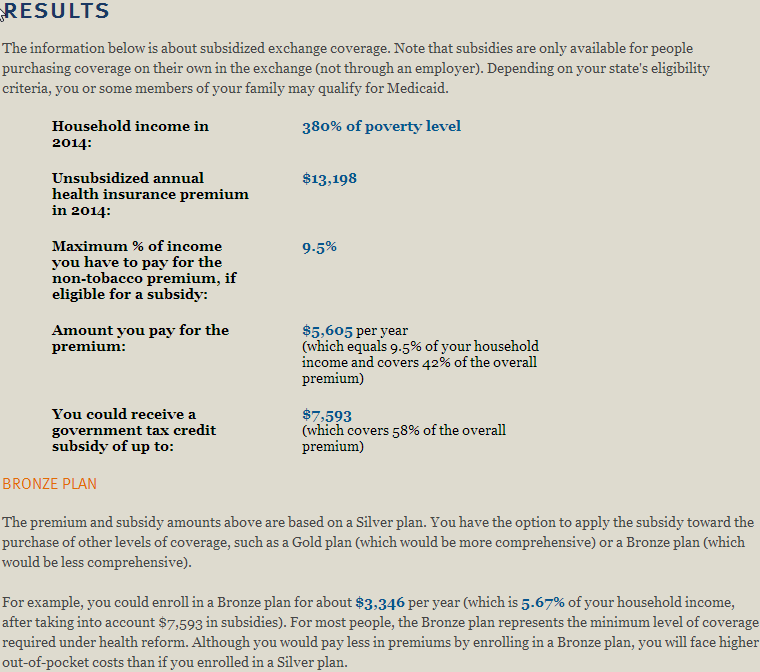 What I find fascinating is that the silver plan from the exchange needs a 58% subsidy to be affordable. As a healthy, middle class person I assumed that the Affordable Care Act is asking me to pay extra to help subsidize the cost of health insurance for someone less fortunate. So who is paying the subsidy for my health insurance and why? Is this real money going into someone’s pocket or a high markup designed to make us feel like we are getting a bargain? Is the Affordable Act stupid, corrupt, or something else?